Hi there, today I have a floral card for you just in time for Spring. I love the pretty Lotus Flower and I thought I would use them again. To create this card I started by creating an A2 size card out of cream card stock. Than I cut a piece of light brown card stock and embossed it using Wood Grain/Leaves embossing plate and distressed it with brown ink to show the design even more. Next I die cut a Card Cover Maker #1 out of cream card stock and cut it off partially to fit my card front. Next I die cut 3 different color Lotus Flowers out of three different color card stock and layered them on the card. 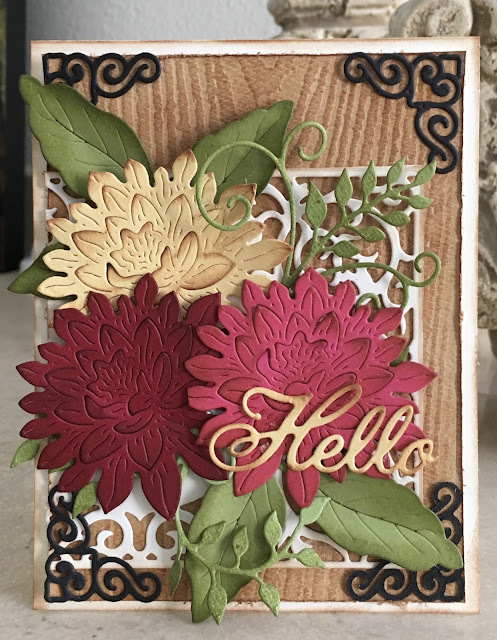 Than I die cut two leaves using the Judy's Blooms and Flourish#3 using green card stock and tuck them under the flowers. Finally I die cut 4 corners using Lord and Commons Accents and black card stock and placed them in the corners and Hello out of yellow card stock and placed it on the flower. Thanks for visiting and hope to see your cards in our newest challenge.